Here's the complete chapter list. Don't miss out on this awesome content. These guys are the best at what they do - they know their stuff. Just reading their various ebooks will be proof enough. This 131-page book will guide you through a results oriented approach to early stage investing. Hambleton (Ham) Lord Ham is a co-founder of Seraf and an active member of the Boston entrepreneurial community. In the early part of his career he was on the founding team of three software companies: MicroChem Technologies, Polygen and Advanced Visual Systems. In 2000, Ham joined a small angel group and became one of the region’s most active angel investors. Since 2002, Ham has been at the forefront of developing best practices for angel investing. Seraf is his latest company with the explicit goal of bringing a new level of professionalization to the angel investment asset class. In addition to his role as a Co-Founder of Seraf, Ham is the Co-Managing Director of Launchpad Venture Group, an angel investment group focused on seed and early-stage investments in technology-oriented companies. Through his involvement with Launchpad, Ham has built a personal portfolio of 35+ early stage investments. In addition, he is a board member or board observer for Building Engines, EveryScape, Qstream and Repsly. Due to the combination of roles as an investor, advisor and angel group leader, Ham was named one of Xconomy's "Top Angel Investors in New England." Christopher Mirabile Seraf Co-Founder Christopher Mirabile is the Chair of the Angel Capital Association and Co-Managing Director of Launchpad Venture Group, an angel investment group focused on seed and early-stage investments in technology-oriented companies. Christopher has served as a public company CFO with IONA Technologies PLC, a management consultant with Price Waterhouse's Strategic Consulting Group, and as a corporate and securities lawyer with Testa Hurwitz & Thibeault. Christopher's portfolio management skills and insights are born of experience. He is a full-time angel and an active member of the Boston-area angel investing community. Not only does he help manage the Launchpad portfolio of 50+ companies, but he has personally invested in over 70 separate fund-raising rounds in 45+ start-up companies and in addition to his direct investments is a limited partner in four specialized angel funds. Christopher is a board member, advisor and mentor to numerous start-ups, and a frequent panelist and speaker on entrepreneurship and angel-related topics. He also serves as an adjunct lecturer in Entrepreneurship in the MBA program at Babson. For these reasons he was named one of Xconomy's "Top Angel Investors in New England." 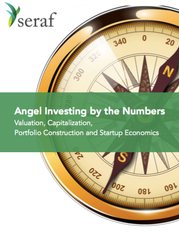 Interested in purchasing a hard copy version of Angel Investing by the Numbers? Buy it now at Amazon.com.